We’ve all heard the term before. 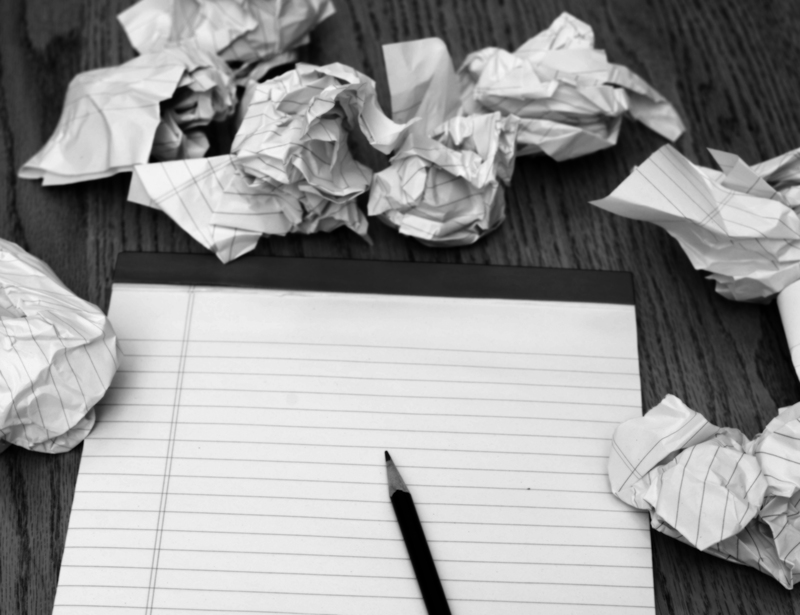 Writer’s block is a common, and often overly used, reason people give up on writing. Now, before you get upset and accuse me of blasphemy, let me explain. Writer’s block is a real thing and a real concern for writers. I’ve been there many times myself. It’s also very frustrating to be stuck in any creative process, such as writing. However, it’s important to understand the difference between writer’s block and procrastination. So, let’s take a closer look, shall we? Writer’s block is defined as “the condition of being unable to think of what to write or how to proceed with writing”. More generally it means that you just can’t come up with something to write about in that moment. The shift from writer’s block to procrastination happens when you use that block to stop completely or push back your writing for months, or even years. And that’s just nonsense! Nor should it be the result of writer’s block. When you go to this place, what you’ve fallen into is procrastination. And that’s mindset that is extremely hard to get out of. Now, before I go on, I will be 100% honest in admitting that I’ve used writer’s block as an excuse before and I’ve also stopped writing for more than a year because it felt too overwhelming to start back up once I stopped. I let too much time pass with the excuse of writer’s block. What I’ve learned from my times of extended lapses in writing is that I did something then that I’m now dedicated to not doing anymore. Writer’s block leads to procrastination, which leads to overwhelm, which leads to stopping completely. So how do you know if you’re dealing with writer’s block and not procrastination? It’s simple. Writer’s block shouldn’t last more than a few hours, truly. Beyond that, you’re just making excuses as to why you can’t write. And it’s not because you can’t, but because you don’t want to. Instead, when you get a block, it’s time to walk away for a while. Think about something else, do something else, and don’t think about what you’re writing, at all. Here are some great ways to work through writer’s block. Keep in mind these only take an hour or two (max), and then it’s time to get back to writing. Don’t go home and start another Netflix binge (yes, I’ve done that too). Take a walk outside: Removing yourself from your writing environment shifts your mindset from that feeling of being stuck. Move your body, breath the fresh air, meet up with a friend. You’ll be surprised what can come from a change of environment. Call a friend: If you don’t want to go outside, or the weather doesn’t allow it, make a phone call to someone who you can talk openly with. You can vent your frustrations to them, or even bounce ideas off of them. Maybe they will even give you some ideas that you hadn’t thought of. Or it could be just a fun chat with a friend to get your mind off your writing. Meditate: This is such a simple practice but probably the most powerful. If you haven’t tried meditation before, I recommend you start today — writer’s block or not. Meditation clears your mind from all the clutter moving around in there and allows you to go within. When you can sit quietly and focus on your breath, you clear space for something new and creative. It’s amazing what ideas will come in. Remember that writer’s block is something every writer goes through. And for most writers, it’s a regular occurrence. But what separates the writers who complete their projects and books, versus those who don’t, is that the former knows how to work through writer’s block. They know how to focus. They have a routine in place. They know their own struggles and setbacks with their writing, and they know how to get unstuck when a block comes. So, next time you feel like making an excuse for why you can’t write – stop and think. Is it truly writer’s block, or are you procrastinating because you just don’t feel like writing? If it’s writer’s block, try one of the above-mentioned techniques to get unstuck and see how they work for you. Procrastination is an evil gremlin if you let it be. Don’t let it control you. YOU have the control. And the more you claim this, the easier it gets to stop procrastinating and get focused. Don’t be hard on yourself through this practice. And remember that perfection isn’t the goal here. Improvement is. Improve your procrastination and writer’s block at the same time and watch your creativity flow. I hope this helps you on your writing journey. Being a writer certainly isn’t easy and it definitely takes A LOT of dedication and discipline. But don’t let yourself be among the many who give up half way because you think you’ve run out of ideas. Fight through it. Honor the struggle and embrace your writing journey. Alysia Seymour is a writer and self-published author of The Raven Dreams. She creates content to inspire people to wonder deeply and dream greatly and how to bring dreams to reality.